Well, it was bound to happen. We decided to do a little Fan dub sample. This fan dub is actually more like a manga read than a real dub though. 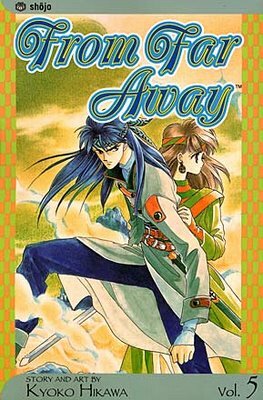 The manga my fiancee Danielle chose for us to read is "From Far Away" by Kanata Kara. It's actually a very loved series and a classic but sadly has never had an animated rendition. Maybe that will change down the road, but who knows. I'm not sure my voice fits Izark...for any type of editing I tend to be very hard on myself ^^;; Anyways, you probably find that Danielle is much better at this than I am. (and I'm the one talking more on how I want to voice dub anime ^^;;) Below you'll see our dub and then the one she did on her own. Check out Danielle's Youtube page here. Of course, From Far Away is owned by Kanata Kara as well as any respected licenses.